There are so many boxes you can connect to your TV these days for movies, music and more delivered via the internet. Jp puts one of the best known against one you've maybe never heard of, but could do twice as much for half the price. Big tech companies spend a lot of money in two primary directions. One, on research and development, pushing the envelope in order to create more enticing products that we, the consumer will hopefully decide we can't live with out and purchase. The other direction is marketing, which includes trying to work out which way consumer habits are trending and to make sure products appeal to that trend. In spite of all these millions of pounds spent, us consumers still manage to change direction, just as they think they've got the measure of us. Go back ten years, the screen we all looked at most was the big one in the corner of the living room. Amercians manage a 34 hour per week average in front of the thing, with folk in the UK spending about 28 hours per week. The battle to win the television, would surely be the ultimate tech battle to win. With that, along came Tivo, Sky+, digital satellite and even the games consoles like the Sony Playstation and Microsoft Xbox morphed into media players capable of selling or renting you movies and TV shows without having to leave the sofa. And how did we respond? We all bought tablets and started to ignore the telly completely! Whilst the grown ups may still sit in front of the TV of an evening, perhaps now distracted by their smartphone or tablet, the children upstairs are not even bothering with television at all - more interested in video served up via social networks and YouTube on their mobile gadgets. Whilst we leave the tech companies (and the folk who actually make television programmes) to figure out how to deal with that, those of us who still like to watch television have a wealth of ways to use it and today I'd like to compare two boxes that add some smart functionality to those otherwise quite dumb rectangles. First up, is Apple TV . People generally think that everything Apple touches turns to gold at the moment, but that's perhaps not the case with Apple TV, which only enjoys relatively modest sales. Apple themselves refer to it as a hobby. That said, it's every bit as well put together as their other products and unboxing an Apple TV makes you feel like you've bought something a bit special and also, a bit of a bargain at under £100. Apple TV is first and foremost, another way to watch TV and movies. Sign in with your Apple ID and the bright and colourful menu launches, offering you access to movies, TV shows and music, all via the iTunes Apple Store. From opening the box to getting to this menu only takes a couple of minutes. Apple TV obviously needs an internet connection (i used a cable, but it can use WIFI) and it'll take a bit longer if you didn't realise Apple don't supply an essential HDMI video cable to connect to your television. A disappointing omission. The supplied remote, which evokes memories of iPod Nanos past is nice and easy to use and the on-screen menus are big enough to navigate without squinting. Likewise, finding a movie or TV show to rent is easy, paying for it might not be however. Yes, all the big hitters are there, but seem bank drainingly expensive to me. This is subjective and £4.50 to rent the latest movie is a good saving over seeing it at the cinema a few weeks beforehand. It's also way cheaper than running a cable subscription, since you only pay for what you use. I'd be happy if the picture quality was better though. I have a 40" LCD with a good surround system and whilst the picture is good for an internet stream (no waiting for downloads here), it's got a long way to go before it matches a blu-ray. For me, I could wait the extra day and have a disc through the post in most cases, for half the rental cost. Films can be rented in HD or SD. HD I would say is as good as a DVD, although this is debatable in fast moving scenes. For convenience though, this is pretty impressive. iTunes is not the only way to get movies and TV shows on an Apple TV however. The excellent web only service 'Netflix' is also available. In the UK, Netflix is relatively new, so the library of content is perhaps not as great as that enjoyed by our cousins in the US, but there is plenty there at a very fair price. As a means to get to Netflix, with iTunes supplementing with the big Hollywood blockbusters, this device definitely makes some sense. Cable companies, watch out? If you have other Apple devices, like an iPhone or iPad; further fun awaits. Playing back your music or video from these devices over your network is easy and 'AirPlay' also allows you to 'mirror' your screen so what is showing on the iPad for example, then gets shown on the TV. This is a great way to share photographs and videos with groups of people, although having a iPad equipped with a retina display did rather show up the totally inferior picture quality of my television. I think I'll stick to passing around the iPad. Your iPhone and Apple TV can also pair up to form a sort of games console, with some smartphone games exploiting the AirPlay connection, so the phone becomes the controller, whilst the action is beamed to the big screen. This sounds great, but without proper buttons, I found it really hard to use my iPad as a controller, whilst looking up at the television whilst playing NOVA 3. So does the Apple represent good value? Well, for an Apple product, yes; and it does sound cheap at under a hundred - but actually there are boxes with similar capabilities available for half that! Meet the Android Network Media Player . There are hundreds of different variants of these on the market, pouring out of China. 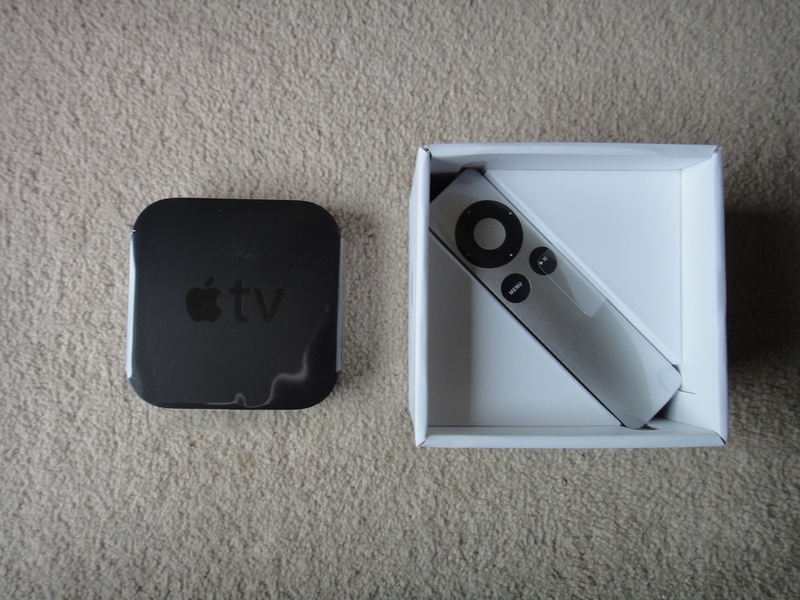 Some, like this, are boxes of a similar nature to the Apple TV, but others have been shrunk still further and are the size of a USB stick and plug directly into a spare HDMI socket, with no need for a cable. This Android does need a cable, but happily in this case, it was provided. Android was not designed for televisions, but this one was advertised with the latest version, which is now available on some pretty large tablets, so there was hope that it would scale to my 40" LCD intact. First impressions aren't bad. Once your eyes have recovered from being near blinded by the LED light on the box, you're presented with two options for the front menu. Neither is descriptively named, but one is clearly for a TV, so I used that each time. Like the Apple TV, big bold icons point the way and the supplied remote allows you to skip to an option. The wording isn't as clear. No jumping straight to a video, or music. Instead, applications, settings, file explorer or web browser. Out of curiosity, I jumped to the web browser first. I don't really favour web browsers on televisions, but this was usable. The remote even has a mouse mode, which works better on the web. Clicking on Applications, you quickly realise that this is a tablet computer forced into a box. All the usual Android apps are there, along with the App Store to buy or download more. On paper, this means that the Android has way more functionality than the AppleTV, but be careful. None of these apps have been written for a television. They expect a finger and a touchscreen. Yes, you can download Angry Birds, no you can't play it. So, is the Android Network Media Player an instant write off? No, not if you don't mind fiddling about a bit. If you want something that just works, I'd probably look elsewhere. But if you enjoy a tinker, this box could end up being all you ever need. For example, it's great for playing your own movie files (I won't ask you where you got them from). Two USB sockets allow you to connect memory sticks and cards and the file explorer will allow you to choose your movie for playback. After a little more confusion (which of the 5 movie player apps do you want to use?) I was pleasantly surprised at the quality. High-definition files didn't seem to be a problem, although one time I thought it couldn't cope, it turned out it was installing updates in the background, so it's no multitasker. If you use other Google Services, for example Google Music, I found the Android app performed well. Apple ask to use their Apple Match music service, which costs. Google's service doesn't cost a penny and I think it's better (My review here). I suspect a lot of people who buy this would expect to make great use of Youtube, but sadly I failed to get it to play one clip. Apart from having to constantly switch between mouse and remote control mode, it failed to start anything. This may just be a bug - but hoping for great tech support for these unbranded devices is a big ask. It didn't even have the Android version stated on the box come to mention it, with no updates available. To sum up, the Apple TV has that lovely 'it just works' thing about it. If you're happy with the itunes pricing, or you're looking for a convenient NetFlix box, I recommend it. The easy connections to iPads and iPhones is cool, but possibly a novelty. The Android Network Media Player promises more than it can deliver. I thought I'd end up recommending wholeheartedly it as I downloaded the NetFlix app from Google Play, but it didn't work properly (again, you can't swipe a finger, so can only play back the items you can see). It makes sense for people of a slightly technical persuasion, who don't mind jumping through a few hoops and it's great for playing back your own movies and it is very very cheap. I've enjoyed my two weeks with both these devices, but, if you could only have one box under your TV my recommended device would have to be hidden option number three, the Playstation 3! For under £150, you get a reliable, easy to use gadget that plays CD, DVD, BluRay and video files. It supports the major UK internet catch-up services like BBC iPlayer and '4OD' along with NetFlix and LoveFilm. Sony will even rent or sell you an overpriced Hollywood blockbuster, so it has all the bases covered and just happens to be an excellent games console too!